The Zodi shower shelter is HUGE! - Almost 4 feet wide per side. Most enclosures get smaller near the shoulders, not the Zodi Hut. The door is overlapped and springs shut automatically without zippers that gum up with mud. 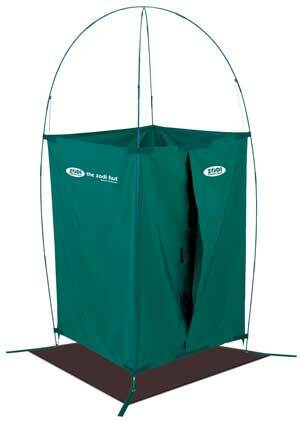 The privacy enclosure works great for showering, bathrooms and changing clothes in private. Oversized detachable floor keeps you clear of mud and dirt. Industrial quality with professional rated components. Elevated sides allows shower water to exit the Zodi Hut without getting the shelter walls wet. You will not be disappointed with this great privacy shelter. *Zodi Hut color for 2010 is Black.